Converted character Barn in a peaceful rural setting with stunning views and facilities. The Village has a church and award winning public house - just a 10min walk from the barn, Only 7 miles to the beautiful historic town of Sherborne with its 2 castles and fine shops. The Jurassic coast - West Bay, Lyme Regis, Weymouth etc - within 30mins drive away. The train line on the outskirts of the village can take you to Weymouth or Bristol and is only a 20min walk away, perfect for a day out in Bath. Lots of country walks across the fields in this fantastic part of Dorset. Indoor heated swimming pool. The Barn has an open plan Kitchen, Living, Dining Room with large terrace on the first floor, with 2 double ensuite bedrooms on the ground floor.Sofa bed in lounge, if required. Please note the swimming pool is only heated and available to use between 31/3/2018 and 29/10/2018. During the colder months the pool will not be heated and unavailable to use. I'm Lorna and live in the farmhouse next to the Barn with my husband and 3 children. We love animals and the countryside and have dogs, cats, chickens and horses. Lovely, peaceful, rural retreat with use of a heated indoor pool. Quiet, space and pool use. Pool is private to the property and is for use of Barn guests and myself and family. We will not use it while you are in there so you'll have it to yourself. Had a lovely stay here with the family this week. The barn was warm and welcoming with everything you need for a home away from home. Ideally located for many local attractions and with the town of Sherborne on the doorstep. We enjoyed visiting the Abbey there as well as going further afield to see Cheddar Gorge and Hive Bay during our stay. 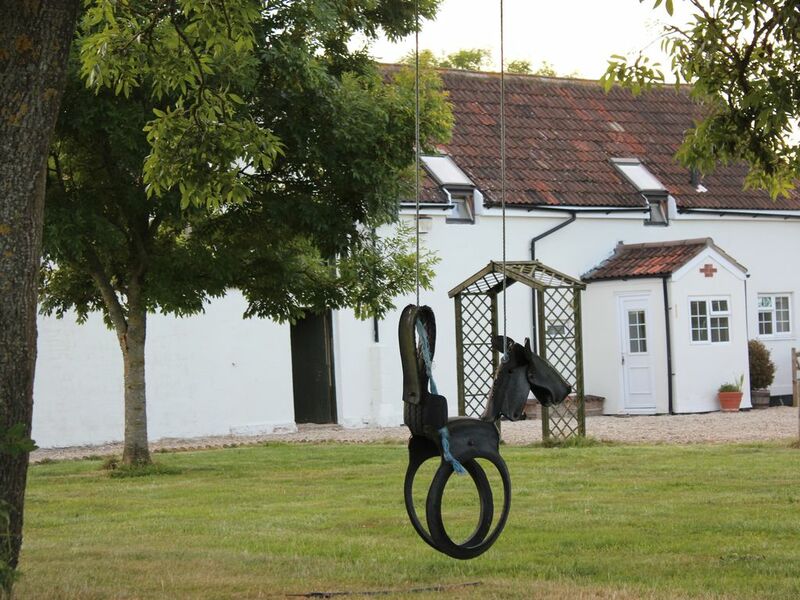 I would highly recommend Park House Barn and the owners Laura and Andrew who were very helpful throughout our stay. Lovely property,comfortable all home comforts and a very welcoming host. Lorna made a real effort to ensure we had a comfortable stay. Great jam and marmalade! Couldn't use pool as our time there was short however it was lovely and would be a real positive addition for a family holiday. A beautiful house in the most peaceful of settings with lovely views. Our grandchildren enjoyed the freedom in a safe environent and took full advantage of the swimming pool. Only 30 minutes away from seaside towns and beaches. A visit to the Deer sanctuary proved to be a wonderful chance to walk with the deer for 2 hours a super experience. We all enjoyed a great time. We had a lovely stay in Park House Barn. The upside down house was perfect for 2 adults, 2 teenagers chilling after exams and 2 old dogs. The pool was a hit with the teenagers. The adults enjoyed the courtyard garden, the lounge and the balcony. Sunny days, barbecue evenings, clear nights - who could want more? The dogs enjoyed walks and sleeping in the yard. Lorna and Andrew were very welcoming and helpful but, unless needed, left us to get on with it. We enjoyed seeing old friends and old places like Sherborne, Yeovil, Weymouth and Burton Bradstock. Fantastic stay. Lorna was lovely and the barn and pool was perfect. A great location to explore the area. Would stay again.